Elaine acquired her undergraduate degree in art education with a minor in graphic and computer design at Radford University and then stayed for another three years to gain her MFA in two dimensional media. Her computer graphics portfolio and gregarious personality got her a job with the Fairfax County Office of Staff Development and Training followed by teaching stints in Oakton High School, Centerville High School, and finally Westfield High School where she heads up the art studio program today. In tandem with her teaching career, Elaine practiced the art of painting. First in a tiny office with a cardboard easel and a sheet of paper taped to the wall so it wouldn’t get spoiled. Painting purely for enjoyment. 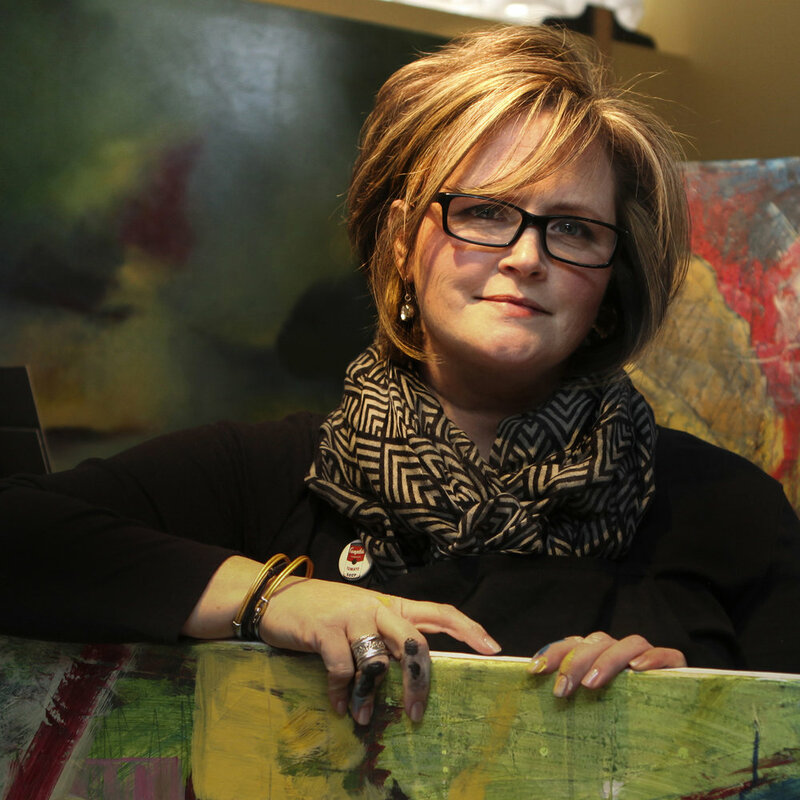 Her confidence increased as she entered art shows in Berryville Virginia’s gristmill fundraisers, but realistic subject matter evolved into more abstract works over time. She came to realize, like artist Richard Diebenkorn, that “It is not a matter of painting life. It's a matter of giving life to a painting… [It’s about] putting down what I felt in terms of some overall image at the moment today, and perhaps being terribly disappointed with it tomorrow... trying to make it better and then despairing and destroying partially or wholly... getting back into it and just kind of frantically trying to pull something into this rectangle that made sense to me.” When Elaine begins to paint in this way, it is like she’s taking a step into an unknown place, surrendering to a process in which the paint and a flick of the wrist lead the way to an image that is synchronized with head and heart.